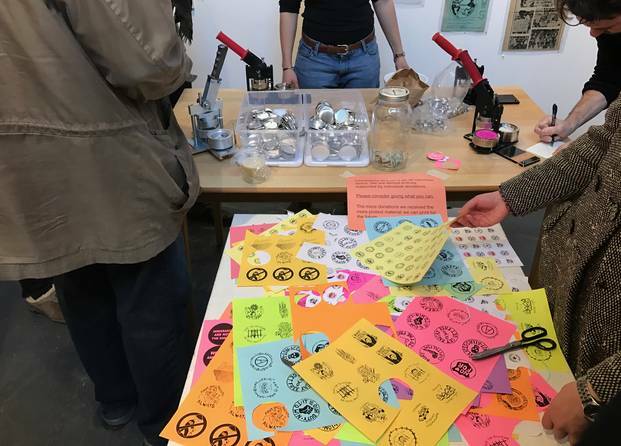 Interference Archive | Open Call: design buttons for us to make at the GetOrganizedBK Civic Festival! Open Call: design buttons for us to make at the GetOrganizedBK Civic Festival! We’re heading over to the GetOrganizedBK Civic Festival on July 25, and we’ll have our button making machines with us! Along with giving away posters and stickers in support of current issues our community is organizing around, we’ll be making buttons with anyone who stops by. We’ll be printing out 1″ and 2.25″ button designs (those are the size of button makers we’ll have on hand). If you would like to design a button, please use one of the templates — here for 1″ buttons, or here for 2.25″ buttons. Please note: we won’t be able to print everything — printing costs are real. Also, we’ll only be able to look at submissions that are on the design templates we’ve linked to above. Let’s create a visual landscape of resistance together!